Kolkata: With no heavy rain on Tuesday, north Bengal flood situation, including the two worst-hit districts of Alipurduar and Jalpaiguri, registered a slight improvement even as the calamity has claimed seven lives so far in the region. Apart from Alipurduar and Jalpaiguri, North Dinajpur, Cooch Behar and Malda were also affected, officials in the respective district administrations said. 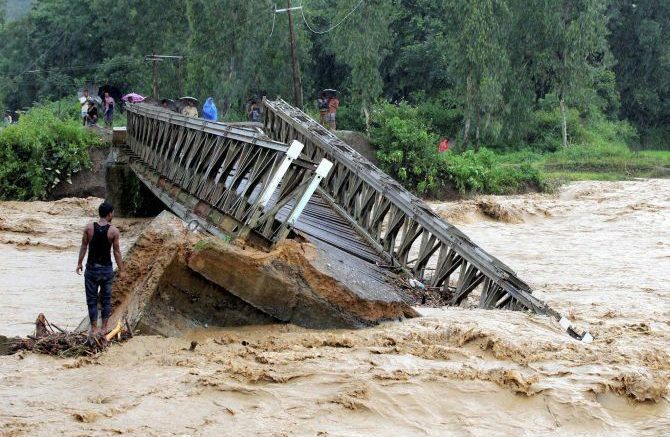 The floods have claimed seven lives so far in the region, while about one lakh people were affected in the five districts—60,000 of them in Alipurduar and Jalpaiguri alone —and many of them had taken shelter in the relief camps, officials in the district administrations said. Since there was no heavy rain during the day, the water levels of all the major rivers in north Bengal, which were flowing above the danger mark, had come down to some extent, they added. The state authorities were monitoring the relief-and- rescue operations round-the-clock as per the instructions of chief minister Mamata Banerjee, the officials said. Communication between Falakata and Madarihat in Jalpaiguri district remained cut off due to large-scale inundation and a majority of the residents of the two areas had taken shelter in the relief camps, they added. Milan Palli in Mal block of the district remained inundated, as was the condition in some adjacent areas, the district authorities informed. Discharge of water from the Gajoldoba barrage into the Teesta river had flooded new areas under Mal block and worsened the situation at places such as Milan Palli, Basusuba and Champadanga, they added. Villages in Dhupguri and Moynaguri blocks of Jalpaiguri were inundated and a large number of people from these areas had taken shelter in the relief camps, the authorities said. However, the overall situation in Jalpaiguri and Alipurduar was improving and if there was no rainfall over the next couple of days, the water level in all the major rivers of north Bengal would fall below the danger mark, they added. According to government officials, the Phulahar river was still flowing above the danger mark in Malda district and many villages under Harishchandrapur block-II and Ratua block were inundated. The situation was similar at Bhutni Island in the district, from where erosion of embankments was reported. Eastern Railway chief public relations officer R. Mahapatra told PTI that a number of trains originating from the city were cancelled as the flood waters were flowing above the railway tracks in areas under the jurisdiction of the North East Frontier Railway. The recent floods in south Bengal had claimed about 50 lives. Be the first to comment on "North Bengal Flood situation improves, death toll at 7"